Brooks Ravenna 9 are stability cushioned running shoes. 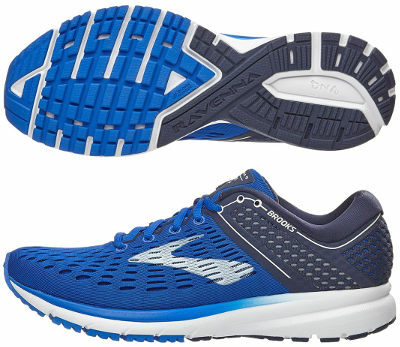 There are so many changes in Brooks Ravenna 9 compared to older editions that basically is no longer a (light) cushioned running shoe but can be considered a performance one. On one hand weight has been reduced by 10% (in a similar way its bigger sibling Adrenaline GTS 18 did) and on the other it becomes more responsive so its closer to popular performance running shoes with pronation support like Asics Gel DS Trainer 23 or Adidas Adizero Tempo 9. The Ravenna 9 keeps classical 10 mm drop and great balance between cushioning and stability for tempo runs and racing distances up to marathon. Upper has been completely revamped and it much cleaner than in its predecessor Ravenna 8 including a multilayer mesh with big holes to increase ventilation and improve breathability. There is also an interesting reinforcement overlay from heel to midfoot which provides a more secure and snug fit. In a similar way as the popular Launch 5 does, well padded and extremely comfortable interior and collar lining would be highly appreciated by brand loyal runners. Midsole configuration remains the same based on well known plush (but resilient) double density BioMoGo DNA foam combined with segmented crash pad for enhanced shock absorption. Progressive pronation control is backed by Diagonal RollBar (DRB) for more natural ride and TPU unit located in the midfoot (DRB Accel) provides balanced support and torsional rigidity. Minor changes in outsole with straighter flex grooves in forefoot looking for more flexibility that enables quicker response. Although grip on wet conditions is not the strongest point among Brooks road running shoes, more robust rubber (HPR+) is used in more exposed areas to increase durability.